Bitcoin continues to struggle overall, but we did see a nice recovery during the day on Friday. The 7250 level seems to be offering support against the US dollar, and the fact that we formed a hammer is a good sign. As you can see by the ellipse that I have marked on the chart, there is a significant amount of order flow in this area. 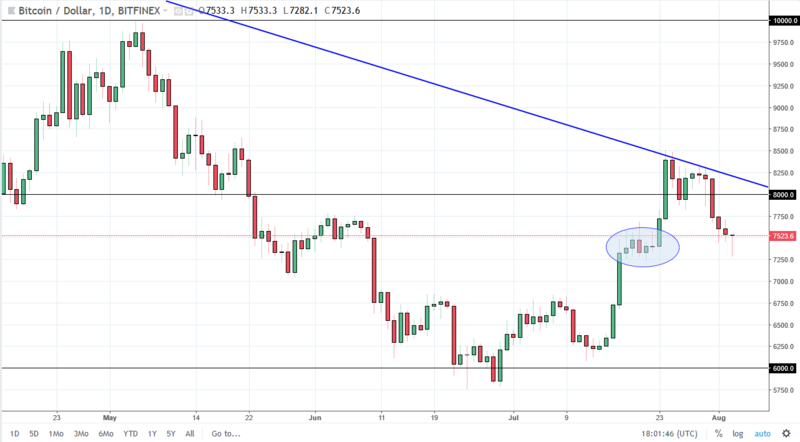 If we break down below the 7250 level, the market could unwind rather drastically, and this is why I think it was so important that we recovered. That being said, I still see a significant amount of resistance above at the trend line, so we may just bounce around back and forth. If we break down below the 7250, I then expect the market to go down to the 6750 handle. 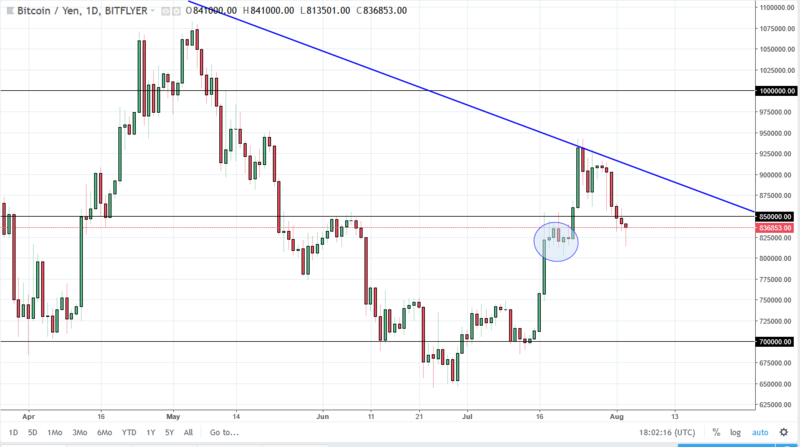 The alternative is to break above the 8300 level, opening the door to 9000. Bitcoin also fell against the Japanese yen during the majority of the session, but just like against the US dollar had a nice recovery to form a hammer. If we can break above the 850,000 level, then I think we go looking towards the trend line above. The alternate scenario is that we break down below the 800,000 level and unwind to the 750,000 level. This market is in an area where I expect see a lot of consolidation and noise, so don’t be surprised if the market gets beaten around over the course of the weekend. I would trade in small positions, and not risk too much until we get a clear and concise break out or break down. However, in the next few days I expect a lot more of the same. Cut Corporate Taxes To Boost Investment And Wages?